For a month now I have an iPhone4 – my first Smartphone with internet access. While I love the possibilities and gadgets this device offers, I was astonished by the enormous amount of energy this thing consumes. 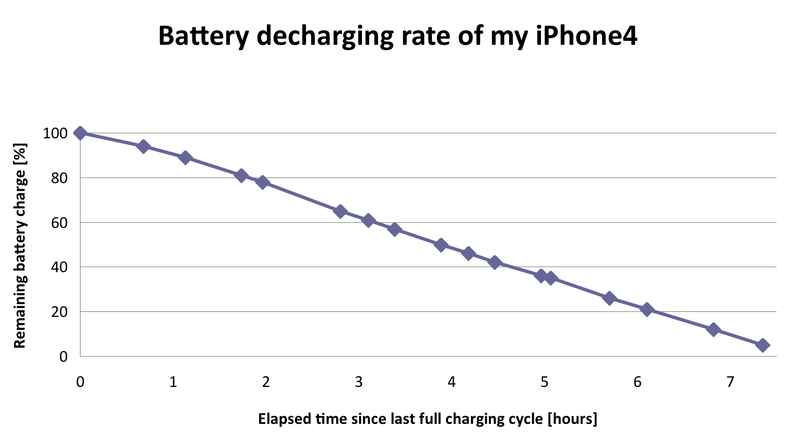 Yes, I knew in advance that the battery won’t last a week like the one of my old Nokia, but I would have been very happy if my iPhone made it through the day without recharging. At first I blamed myself and played around with the full arsenal of energy saving options the device offers. Dim the screen, switch off wifi, bluetooth and GPS if not needed, kill applications running in the background (double-click the home button if you’re not familiar with it…). But it did not help. The iPhone went dead in one day. So I did a field test today. I went to the office and charged the device full. At 100% I unplugged it and held it in standby. No surfing, no emails, no games, just click once to read the time and battery status. I received one call lasting 4min30sec during the measurement time. The battery goes dead within 8 hours of standby Remember – I did not use it, just one call lasting 4min30sec ! There MUST be something wrong with that thing. So I called Apple support. They advised me to erase and restore the device. If the problem still persists the iPhone will have to be sent in for repair. Gee, I hope they have an exchange program. Otherwise I could be stuck without a cellphone for quite some time (ah yes, the Micro-SIM for the iPhone won’t fit into my old Nokia). That’s bad news for a device that cost me a small fortune (bought it at Apple directly because I did no not like those expensive contracts). Now I have set up the device again and wait for it to recharge. Before I go to bed I will unplug it and tomorrow in the morning we will see.